A romesco (aka salsa romesco) is a sauce (really, a smooth paste) from the Catalan region of Spain. It can be made many different ways, but the core ingredients are traditionally fried bread, almonds and hazelnuts, vinegar, garlic, and tomatoes. This more modern romesco uses tea biscuits (or in this case shortbread cookies) instead of fried bread. 1. Spread hazelnuts and almonds onto a sheet pan and toast in a single layer for about 10 minutes in a 375 oven until golden brown and fragrant. 2. Reconstitute the dried chiles. 3. 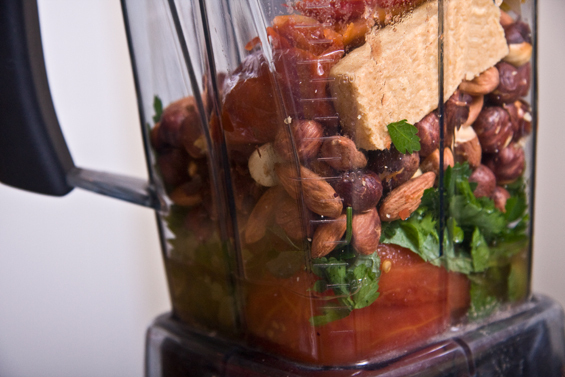 Add the toasted nuts to a blender or food processor with tomatoes, mint, parsley, reconstituted chilies, biscuits and vinegar. Blend. 4. 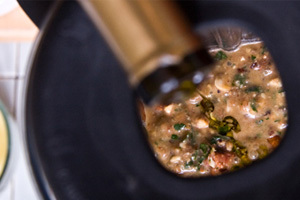 Slowly drizzle in olive oil until emulsion is formed. 5. The end result should be thick, almost a hummus consistency. This looks delish. Must make it to the grocery store. I can’t wait to try this and see what my husband thinks. Of course I already know. He will love it. Thanks for the recipe.